Employees of The Promoter and their immediate families, associated companies and agencies are ineligible to enter. Individuals must be Australian and New Zealand residents and over 18 years of age to be eligible to enter. The promotion commences on Tuesday 14/08/18 and ends at 5pm AEST on Wednesday 29/08/18 (“Promotional Period”). (b) ‘Make a comment’. 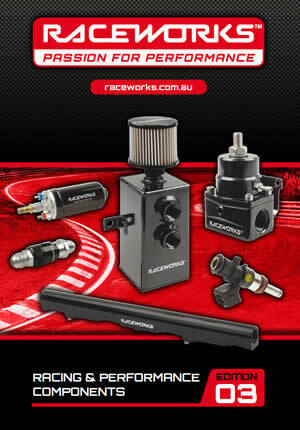 Suggest a NEW PRODUCT that you’d like to see in the Raceworks range. Comment or add an image. The comment / image judged the best will win (two prizes will be awarded). A Walkinshaw Andretti United Supercar Hot Lap at Sandown Raceway on Monday 17th September 2018. The total value of the major prize is $600.00AUD. The winner shall be the owner of the Facebook account from which the selected winning entry is sent. The judging will take place after the Promotional Period at Premier Auto Trade 36-40 Shearson Cres Mentone VIC 3194. The prize winner will be notified via their Social Media account after the draw to organise the claiming of their prize. The Judges’ decision is final and no correspondence will be entered into. While every effort will be made to accommodate the prize winners, there are some hot lap restrictions. Your ride day experience will take place in a real Supercar, your ride will be at high speed and it will be high impact. To avoid any potential disappointment or embarrassment at the track, please read the below information carefully. The guidelines and restrictions are to ensure maximum participant safety at all times. There is a maximum weight limit of 105kg and a maximum height limit of 193cm. This may be based on a height / weight ratio. ALL participants must be 18 years of age or over. Minors will NOT be permitted in the car. Suit sizes range from S – XXL only and you must fit one of these suits to ride in the car. The race team ultimately reserves the right, under any circumstance, to restrict a participant from partaking in the ride. Participant will be supplied an FIA approved driving suit, gloves, helmet and Hans device. Participants are required to wear full length pants, fully enclosed footwear and socks that cover your ankles – we recommend sneakers (NO high heels or ballet flats). NO privately owned helmets or suits are permitted. NO privately owned cameras or mobile devices will be permitted in the car. Pockets of clothing must be empty prior to putting on the suit and entering the car. You must be able to get yourself in and out of the confined space of a race car unaided. If you have a pre-existing health condition (e.g. heart conditions, back problems, aneurisms etc), we require a letter from your medical practitioner stating that travelling at speeds up to 250 km/h will not impact your health condition. Please also advise the Mobil 1 Boost Mobile Racing team of any limitation of limb function and/or absence of limbs. This experience can be affected by the weather. For the safety of all, the crew will assess weather conditions and act accordingly. Release Form – You are required to sign a Release Form on the day, prior to taking your ride. Please ensure you read the content of the release form carefully so you are aware of what you will be signing, and you are taking this ride entirely at your own risk. Spectators are welcome to attend on the ride day with the participant but can only view the track from the designated areas. Please note, any children under the age of 18 are required to be in the control of an adult at all times. Cancellations – Under extenuating circumstances, the Mobil 1 Boost Mobile Racing team reserves the right to alter ride dates, locations and session times. Every effort will be made to communicate the changes in a timely manner to limit any related inconvenience. In the case of the prize winner not meeting the restrictions outlined above, they may allocate their prize to a friend or family member whom does at the discretion of The Promoter. The competition winner must confirm their acceptance by 5pm AEST on Thursday 30/8/18. The hot lap experience may be recorded via video, audio and still image capture, and the competition winner’s likeness may be included in the footage. Entering into this competition is acknowledgement by The Entrant that they accept that the recorded footage may be published and distributed by The Promoter by, but not limited to, The Promoter’s website, social media pages, and/or electronic direct mail. The Promoter reserves the right, at any time, to invalidate any entries (and entrants who submit or cause those entries to be submitted) which it reasonably suspects have been submitted: (a) using false, incorrect, fraudulent or misleading information, including but not limited to personal details and contact information; (b) through the use of multiple identities, email addresses or accounts; and/or (c) in any way in contravention of these Terms and Conditions. The Promoter reserves the right, at any time, to verify the validity of entries and to disqualify any entrant who submits an entry that is not in accordance with these Terms and Conditions. The winners may be announced via a comment published by The Promoter under the winning comment, and/or via a post published by The Promoter on their Facebook page. This promotion is a game of skill and chance plays no part in determining the winner. Travel, accommodation and any ancillary costs and bookings are the responsibility of the winner to arrange and fund as required. The Promoter’s decision in relation to any aspect of the competition is final and binding on each person whom enters. The prize is not exchangeable and cannot be taken as cash. All entries (including image and content text) become the property of The Promoter. The entries may be shared by The Promoter’s on, but not limited to, The Promoter’s website, social media pages, and/or electronic direct mail, unless otherwise stated by the entrant. Any change in value occurring between the publishing date and the date the prize is claimed is not the responsibility of The Promoter. Entrants will become ineligible if they unlike The Promoter’s Facebook page during the Promotional Period. Entrants provide their information to The Promoter and not to Facebook. This promotion is in no way sponsored, endorsed or administered by, or associated with Facebook. Each entrant agrees to completely release Facebook from any and all liability in connection with this Promotion. The Promoter collects personal information (“PI”) in order to conduct the promotion and may, for this purpose, disclose such PI to third parties, including but not limited to agents, contractors, service providers, prize suppliers and, as required, to Australian regulatory authorities. Entry is conditional on providing this PI. The Promoter shall not be liable for any loss or damage whatsoever suffered, including but not limited to direct or consequential loss, or personal injury suffered or sustained in connection with any prizes.